(1) Triangle : It is a closed figure formed by three intersecting lines. It has three sides, three angles and three vertices. 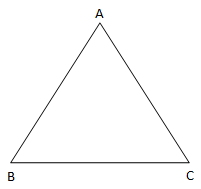 Consider a triangle ABC shown below: The triangle ABC will be denoted as ∆ ABC. 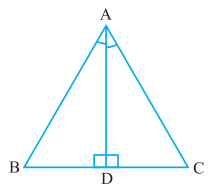 Here, ∆ ABC have three sides AB, BC, CA; three angles ∠ A, ∠ B, ∠ C and three vertices A, B, C.
(2) Congruence of Triangles: The word ‘congruent’ means equal in all aspects or the figures whose shapes and sizes are same. For triangles, if the sides and angles of one triangle are equal to the corresponding sides and angles of the other triangle then they are said to be congruent triangles. Note: CPCT is short form for Corresponding Parts of Congruent Triangles. Statement: Two triangles are congruent if two sides and the included angle of one triangle are equal to the sides and the included angle of the other triangle. Now, since two sides and an included angle of triangle are equal, by SAS congruence rule, we can write that Δ AOD ≅ Δ BOC. Statement: Two triangles are congruent if two angles and the included side of one triangle are equal to two angles and the included side of other triangle. Proof: Suppose we have two triangles ABC and DEF, such that ∠ B = ∠ E, ∠ C = ∠ F, and BC = EF. We need to prove that Δ ABC ≅ Δ DEF. Case 1: Suppose AB = DE. From the assumption, AB = DE and given that ∠ B = ∠ E, BC = EF, we can say that Δ ABC ≅ Δ DEF as per the SAS rule. Case 2: Suppose AB > DE or AB < DE. Let us take a point P on AB such that PB = DE as shown in the figure. Now, from the assumption, PB = DE and given that ∠ B = ∠ E, BC = EF, we can say that Δ PBC ≅ Δ DEF as per the SAS rule. This thing is possible only if P are A are same points or BA = ED. Thus, Δ ABC ≅ Δ DEF as per the SAS rule. On similar arguments, for AB < DE, it can be proved that Δ ABC ≅ Δ DEF. Now, as per AAS Congruence Rule, we can say that Δ AOD ≅ Δ BOC. Hence, BO = AO which means CD bisects AB. Theorem 1: Angles opposite to equal sides of an isosceles triangle are equal. Proof: Suppose we are given isosceles triangle ABC having AB = AC. We need to prove that ∠ B = ∠C Firstly, we will draw bisector of ∠ A which intersects BC at point D.
For the Δ BAD and Δ CAD, given that AB = AC, from the figure ∠ BAD = ∠ CAD and AD = AD. Thus, by SAS rule Δ BAD ≅ Δ CAD. 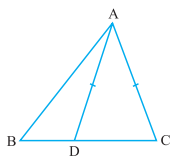 Therefore, ∠ ABD = ∠ ACD, since they are corresponding angles of congruent triangles. Hence, ∠ B = ∠C. Given that BE = CD. BE – DE = CD – DE i.e. BD = CE. Therefore, by CPCT, AD = AE. Theorem 2: The sides opposite to equal angles of a triangle are equal. So, Δ ABD ≅ Δ ACD by ASA congruence rule. Therefore, by CPCT, AB = AC (CPCT) or in other words Δ ABC is an isosceles triangle. Statement: If three sides of one triangle are equal to the three sides of another triangle, then the two triangles are congruent. For Example: Two sides AB and BC and median AM of one triangle ABC are respectively equal to sides PQ and QR and median PN of Δ PQR. Show that Δ ABM ≅ Δ PQN. From the figure, we can see that, AM is the median to BC. So, BM = ½ BC. Similarly, PN is median to QR. So, QN = ½ QR. Given that, AB = PQ, AM = QN and AM = PN. Therefore, Δ ABM ≅ Δ PQN by SSS Congruence Rule. Theorem 1: If two sides of a triangle are unequal, the angle opposite to the longer side is larger (or greater). 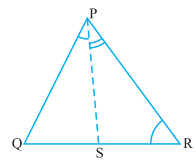 Theorem 2: In any triangle, the side opposite to the larger (greater) angle is longer. Theorem 3: The sum of any two sides of a triangle is greater than the third side. For Example: For the given figure, PR > PQ and PS bisects ∠ QPR. 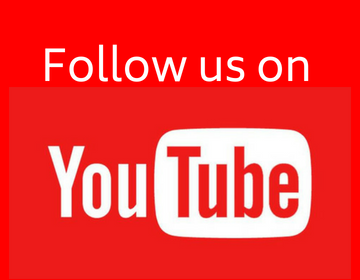 Prove that ∠ PSR > ∠ PSQ. Given, PR > PQ. ∠ PSR > ∠ PSQ. 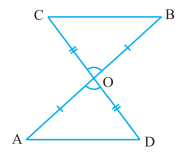 Hence, ∠ ADC = ∠ ACD as they are angles opposite to equal sides. Now, ∠ ADC is an exterior angle for ΔABD. Therefore, ∠ ADC > ∠ ABD or, ∠ ACD > ∠ ABD or, ∠ ACB > ∠ ABC. 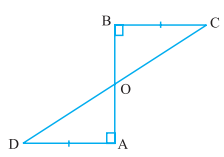 So, AB > AC since side opposite to larger angle in Δ ABC. In other words, AB > AD (AD = AC).